NOT MANY PEOPLE are aware of Khadijah Ibrahim’s relationship with literature (she likes having literary fiction read to her!) and her love of books on food and interior design. Of course she’s famous for being a great singer. Her sonorous voice and sophisticated interpretations offer a distinctive style that is equally at home with Malay ballads, soul classics, jazz standards and Broadway showstoppers. With 18 albums (15 Malay albums and three English albums) to her credit, she has stayed the course in an industry known for its fickleness and transience. 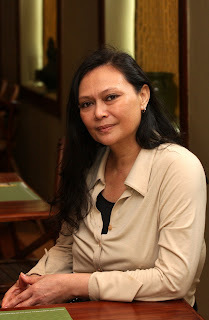 Besides being one of Malaysia’s most enduring entertainers, she is also a wizard in the kitchen, and has a growing reputation as an interior designer with a penchant for marrying the traditional with the contemporary. How long have you had this restaurant? We opened for business five and a half months ago. However, we have had this restaurant in Christchurch, New Zealand, for seven years. We plan to open two more restaurants: one in New York and another in Frankfurt. We have a variety of signature dishes here. We have the Chinese tauhu telur (egg tofu) with Malay sauce. Our curry-leaf chicken is popular. Our kari ikan (fish curry) is pretty famous—people from the north always ask if I’m from Penang. We also serve a dish which uses squid ink as an ingredient, popular among the Italians and Greeks. If you’re Johorean or from Malacca, you would also be familiar with this dish. How much time do you spend in the restaurant each day? I divide my time between singing and cooking because my 30th (“pearl”) anniversary concerts are on 17 & 18 November 2008. So I’m sorting out all my songs—my English and Malay albums, plus I am writing a script documenting my 30-year journey in the Malaysian music industry. For your restaurant’s decor, did you read any books for ideas? Perhaps because I’ve worked on the design of a number of residences and offices, when it came to my own place, I didn’t really look at books. When I do need to refer to books, I have thousands of them on interior design and handicrafts. I show them to my contractors when I need to guide them on what I want. Life, basically. Life is good. I enjoy my surroundings, family and friends. I love what I do. If you love something, you tend to do it effortlessly. How would you say the Malaysian music industry has changed since you began singing in the 1970s? It has changed so much. Of course, during my early years there weren’t any talent awards. Success was very much based on quality and building a loyal fan base. You didn’t hear people sounding the same. Everyone had their own identity and vision. I don’t think you can say the same today. Did you find your singing career stressful? No, I found it interesting because I actually had my entire show scripted, including all the songs and lighting. Nowadays if some VVIP happens to be there and they want bright lights and chandeliers, you just sing with the lights in your face, looking like a corpse on stage! What do you read for leisure? I read mainly cookery books for recipes and interior design ideas. Wherever I go in my travels, I will grab something new, and my luggage is usually laden with books. Could you name a title or two that come to your mind? I have a prized coffee-table book on balconies outside the restaurant (Balconies, Exterior and Garage Doors, originally published in Barcelona in 1997). I’ll kill whoever loses it or puts it in their handbag! These kinds of books are hard to come by in Malaysia. You need visuals to explain how you want your design to appear, for example, in using wrought iron and wood. If you just try to explain concepts to contractors, they do not know what they are. Not everybody is a specialist in balconies, and not everybody has read such a book. Do you plan on writing a biography or cookbook? Perhaps a cookbook some time in the future, but not now. I find that too many Malaysian entertainers are writing cookbooks. It should be a cookbook where the recipes are all your own. It must be unique and authentic. Otherwise, there is no point producing one. So what’s next for Kathy Ibrahim? This is a special year for me. I am working on two new albums and a two-night solo concert at Dewan Filharmonik PETRONAS in November which will chart my career. Tickets are priced at RM50, RM80, RM100 and RM120, and are available at Dewan Filharmonik PETRONAS box office. Not a literary comment, I know, but Christchurch, New Zealand is where my father lives - do you know whether Kathy Ibrahim's restaurant is still open there? Dear Tim: I hope you're well. I've checked with Kathy with regard to your query. I'm afraid Kathy no longer has the restaurant in Christchurch. When she returned to Malaysia a few years ago she sold up. The PJ restaurant is her first food venture since then. Hi Eric! I am so happy I found this blog. 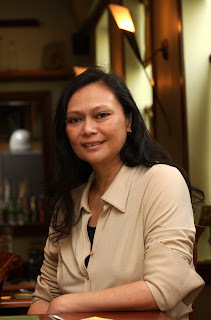 I am from Singapore and was in KL for the last two weekends looking for Dato' Kathy's restaurant. It was profiled on TV3 and we were so excited to eat there. Now I know where to go. I am also hoping to be able to see her there. Can you provide us an email address for the restaurant? How are you doing? Have you an email address for me for the reataurant and will Dato be at the restaurant on Saturday night for dinner? Your great assistance is much appreciated. I have no idea, but you could call the restaurant and check. Thank you so much for this blog. Finally got to the restaurant and its superb!!! Thumbs up Dato' for the great food as well the warm hospitality! Love you. And thanks Eric for this info.